Join us Monday, July 31st at 7pm for a special event in honor of The Painted Queen by Elizabeth Peters and Joan Hess. Barbara Rosenblat will read from and discuss the book. 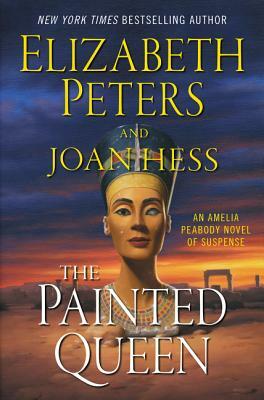 The Painted Queen follows Amelia Peabody and her dashing archeologist husband, once again in danger as they search for a priceless, stolen bust of legendary Queen Nefertiti and Amelia finds herself the target of assassins in this long-awaited, eagerly anticipated final installment of Elizabeth Peters' bestselling, beloved mystery series. Arriving in Cairo for another thrilling excavation season, Amelia is relaxing in a well-earned bubble bath in her elegant hotel suite in Cairo, when a man with knife protruding from his back staggers into the bath chamber and utters a single word--"Murder"--before collapsing on the tiled floor, dead. Among the few possessions he carried was a sheet of paper with Amelia's name and room number, and a curious piece of pasteboard the size of a calling card bearing one word: "Judas." Most peculiarly, the stranger was wearing a gold-rimmed monocle in his left eye. For Amelia, this excavation season will prove to be unforgettable. Throughout her journey, a parade of men in monocles will die under suspicious circumstances, fascinating new relics will be unearthed, a diabolical mystery will be solved, and a brilliant criminal will offer his final challenge . . . and perhaps be unmasked at last. Barbara Rosenblat is a popular film/stage/television actress who is one of the most sought-after narrators of audiobooks in the country, having amassed nearly 500 titles -- including all of the books in Elizabeth Peters' legendary Amelia Peabody series. Through the years Barbara and Elizabeth Peters became close personal friends and enjoyed spending time together at Ms. Peters' lovely home. Barbara's mellifluous voice and extraordinary range of accents and abilities have earned her 8 coveted Audie Awards - more than any other narrator. She has earned over 50 Golden Earphone Awards from Audiofile Magazine for superior recordings, and has voiced many radio and television commercials and documentaries, as well as animation and video games. She received international praise for her performance as the cancer-stricken inmate 'Miss Rosa' on the Netflix Original Series Orange is the New Black. She also appeared on Veep, Girls, Limitless, Gotham, and Law and Order SVU. On Broadway she created the role of 'Mrs. Medlock' in the Tony Award-winning musical The Secret Garden. Barbara Mertz, aka Elizabeth Peters, began her career with a Ph.D. in Egyptology from the University of Chicago's Oriental Institute. As Barbara Michaels, she published 28 thrillers. As Elizabeth Peters, creator of the legendary Amelia Peabody series, she wrote 20 novels, expressing her passions for adventure, archeology, humor, Edwardian England, and the sands of Egypt. Over the course of her 50-year career, Barbara was the recipient of numerous writing awards, starting with her first Anthony Award for Best Novel in 1989. A cascade of prestigious awards and nominations followed over the years, including grandmaster and lifetime achievement awards from the Mystery Writers of America, Malice Domestic, and Boucheron. In 2012, she was given the first Amelia Peabody Award, created in her honor, at the Malice Domestic convention. She died in 2013, leaving a partially completed manuscript of The Painted Queen.